James Forrest Kiick was born August 9, 1946 in Lincoln Park. Fast and powerful, with great anticipation and extremely quick feet, he excelled at virtually every sport he tried. No one was particularly surprised. His dad, George, had been a star running back for Bucknell in the 1930s and was drafted by the Steelers—only to have a promising pro career undone by World War II. Jim was a standout at Boonton High School in baseball, basketball, and football. On the gridiron he was better know as a hard-hitting defensive back than as a running back. It was as a runner, however, that University of Wyoming coach Lloyd Eaton recruited Jim in 1964. Jim made the varsity in 1965 and the Cowboys went on to enjoy back-to-back 10–1 seasons in 1966 and 1967, with Jim was their star runner. He was the first player to earn First-Team All-WAC three years in a row. Jim was named MVP of the 1966 Sun Bowl as Wyoming beat Florida State 28–20 on Christmas Eve. He ran for 135 yards and a pair of touchdowns in that game. Jim closed out his college career with an appearance in the 1968 Sugar Bowl. He scored an early touchdown to help the Cowboys open a 13–0 halftime lead, but LSU scored 20 unanswered points in the second half to win 20–13. All told, he racked up 1,714 rushing yards and 52 pass receptions. 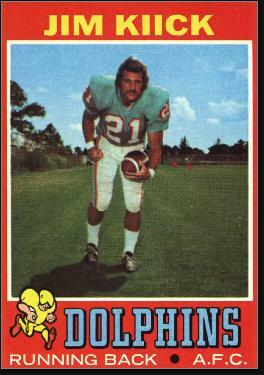 Jim was a fifth-round draft pick of the Miami Dolphins in 1968. He shared the backfield with team’s top pick that year, Larry Csonka of Syracuse. Jim was voted to the American Football League All-Star Game in 1968 and 1969. In 1969, he tied for the league lead with 9 rushing touchdowns. In 1971, he helped the Dolphins win the AFC Championship, however Miami fell to the Cowboys in the Super Bowl. Between running and pass-catching, Jim was good for around 1,000 yards from scrimmage in each of his first four years. He and Csonka were nicknamed Butch Cassidy and the Sundance Kid. In 1972, a third player joined the backfield, Mercury Morris. Coach Don Shula wanted more speed in the lineup. Morris started games but would come out in short yardage situations, and Jim would replace him. In 1975, Jim and Larry bolted the NFL for the year-old World Football League. They teamed up in the backfield for the Memphis Southmen. Unfortunately, the WFL didn’t survive its second season, and Jim returned to the NFL, this time as a member of the Denver Broncos. He played for Denver in 1976 and part of 1977, but was released during the year and did not get to play on the Broncos’ Super Bowl team that January. On the same day he was cut, his marriage ended and his house was destroyed by a fire. After football, Jim returned to South Florida, where he worked as a private investigator. He also ran a sports marketing company that specializing in booking retired athletes for celebrity appearances. Jim’s daughter, Allie, added to the family’s sports legacy on the tennis court as a member of the WTA Tour, working with coach Brian Gottfried. In 2009, Jim’s mental acuity began to decline and he was ultimately diagnosed with Alzheimer’s disease. He moved into an assisted living facility in 2015.